It was something I’ve been fearing and has been reported through a lot of sources now (from IDC numbers). 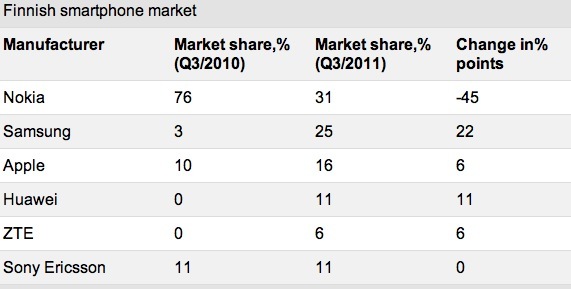 Nokia’s home market share is less than half what it was this time last year. What are the new competition beating phones in the Nokia portfolio? E7? X7? C7? Hello? What did we have against the competition apart from the N8 during Q4 2010? Q1 2011? Q2 2011? Huh? Stronger competition with iPhone and Androids. Again, portfolio. Where was all the good stuff? What kind of apps were available on Nokias in 2010 and subsequently 2011? Androids eating up Nokia share with cheaper phones that essentially offered better user experience. Nokia has seriously given the competition the easiest time ever to trample over them this past year. When stuff like the Samsung Galaxy S, iPhone 4, HTC Desire, then SGSII, what was the best thing Nokia could offer? The N8. The N8 with original Symbian^3 – not even with Anna. Nokia N9 essentially is a Q4 product, as is the Nokia Lumia 800. Likewise, the Belle phones – Nokia 603, Nokia 700, and Nokia 701 could only really make an impact for Q4. Until then, what exactly did we see Nokia offering? It was around this time I found it hard to recommend any other Nokia phone apart from the N8 and its spectacular camera. E7 vs SGSII with pricing just a touch more expensive on SGSII at the time? Say what? There’s not even a successor for the N8 this year. There’s no flagship Symbian in 2010. What year has there been no new flagship Symbian? (701 is not that). BTW does anyone have the numbers from Q2 2010, Q4 2010 to Q1, Q2, Q3 2011? I hope to God Nokia has some actual flagship deserving products in 2012. Give me that high end N8 successor. Give me the Nokia Lumia 900 that has no excuse any more for not delivering high end features. Maybe even give us that phone that apparently continues Swipe features. The N9 is fantastic. The Lumia 800 is a great start. But that’s not good enough really in the world where your competitors are always pushing the boundaries. What are you doing? What happened to that incredible 12mp camera in the N8 huh? The N9 and 800 are being trounced in the camera department by an iPhone. Jeez! Stop going backwards for goodness sake! We need one awesome product in 2012, and then another, and then another, and then another. Right now I think it’s important to focus first on mindshare. Bring back the great and fantastic Nokia products we know you can and have made. The ones that set the bar not just for your portfolio but for the competition too. Keep the marketing going to let folks be aware of your products. I think it is possible to reverse the current negative image of Nokias – we just need to have some really amazing Nokia products next year. Please, before you release something, take a look. Is it mediocre? If it is, go put that thing in the bin unless of course you price it cheaply enough. Nokia, don’t mass produce a million variations of crap that harms your brand. Look how you destroyed Nseries. Again, repeat because it cannot be said enough times. Give us more great designs, great user experiences, and new up to date features. Back it up with the marketing so consumers will be aware and give your products a chance. This is all just plain common sense stuff, but based on the crap they’ve been doing since 2007 you just can’t take it for granted that they’d avoid stupid, obvious adventures to Fail-Land. What you did with 800 marketing, pump the same into 900. But better. Always strive for better. Don’t ignore the new Belle phones either. You still have much to gain there. Don’t waste it away on mediocre hardware.